Spring is the season of renewal. In the spring, many animals are born, birds return to their northern homes and begin building nests, plants poke their leaves out from the ground, and humans bring out their bicycles and pedal to the park. 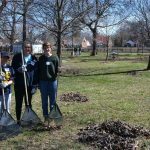 But in our urban environment, humans must play another special role in the renewal of spring: they have to find a way to clean up outdoor spaces for another year of outdoor activity. 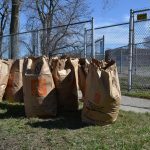 Detroit Partnership Day functions to do just that. 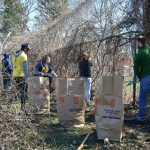 On Saturday, April 1, the University of Michigan’s largest volunteer event “DP Day” partnered with communities across Detroit for a day of neighborhood cleanup. 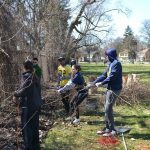 Teams of students, under the direction of resident leaders, tackled Ramsey Park, Rosemont-Acacia Park, North Rosedale Park Community House, Minock Park, and portions of Southfield Service Drive. 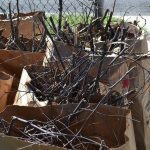 Over 80 students and residents cleared leaves, yard waste, litter and debris from parks and roadways, concluding the event with 200+ filled waste bags! 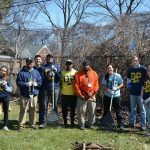 The Detroit Partnership – the student organization that organizes DP Day – engages over 1,500 student volunteers a year in various Detroit projects. 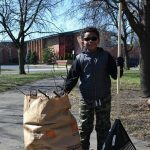 According to its website, the organization’s mission is “to raise awareness, challenge stereotypes, and promote social justice through…service-learning programs and educational events.” The Detroit Partnership, which students created in 1999, is now a registered 501(c)(3). 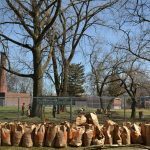 Grandmont Rosedale neighborhoods have enjoyed the years of partnership with the University of Michigan. We look forward to more spring renewals and more DP Days to come!